All the scenes are great but the 4th got my attention because of that light ring.I guess that can be used as a light trail for the Tron Bike if i can get a bike on bryce as obj .Maybe i missed something, is there a tutorial or which material is used on that light ring? Ty. For those who want to play with a Tron Bike here is a free bike http://www.turbosquid.com/FullPreview/Index.cfm/ID/549520 unfortunately in .blend format for blender but with textures . 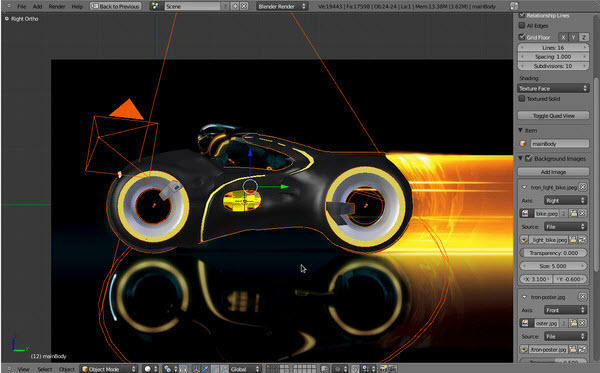 And here is another free Tron Bike http://www.turbosquid.com/3d-models/free-ma-mode-tron-legacy-light/712498 but unfortunately in .mb for Maya without textures and under STUDENT LIcense (free Maya version for students) which means can not be redistributed as a model on that form. 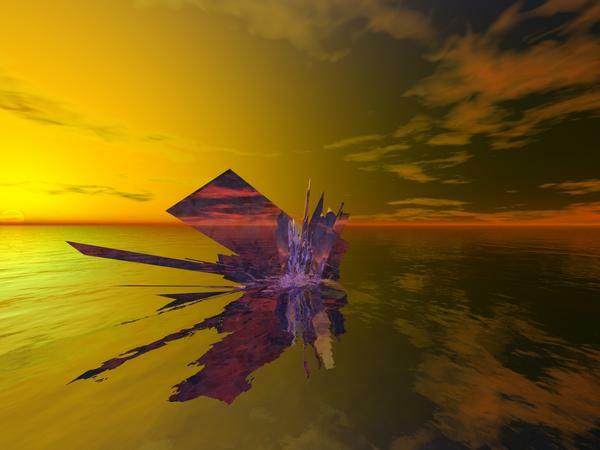 Did you use ChaosPro to make the cube for the image you posted here? I used Wings.for that cube. well its freezing here, so I thought I do an appropriate Bryce image. That's gorgeous!! I like that a lot!! The rings are for a demonstration of something not working, but the effect is interesting. The video to go with these specific files has not yet been made, I'm still at the experimenting/planning stage. However, the effect is also covered here. If you want to capture the effect in mid air, you could use a material that is both transparent and diffuse - that way it only shows up where light hits it. Much like the same process with shadow capture for HDRI - but turned on its head - indeed it is easier to capture light than it is to capture shadows. The shadow capture videos are in the list over at Bryce Tutorials, as the one listed above. @ Stuart – now that’s a cool idea, Rubik’s Cube for beginners. I have ChaosPro but never realized I would export as an object. Thanks for posting the link. I will have a look and see if I can export them as objects. @ David – your various experiments are every inspiring. @ Dan – that’s one great image. @ Cjreynolds – I like both your images. David also did a video on the first. I remember seeing the video but did not do the tutorial. @ Dave – very nice work. @ Eireanne – I like your enthusiasm to try new things. Thanks for sharing. @ Keryna – very nice silvery/topazy abstract. 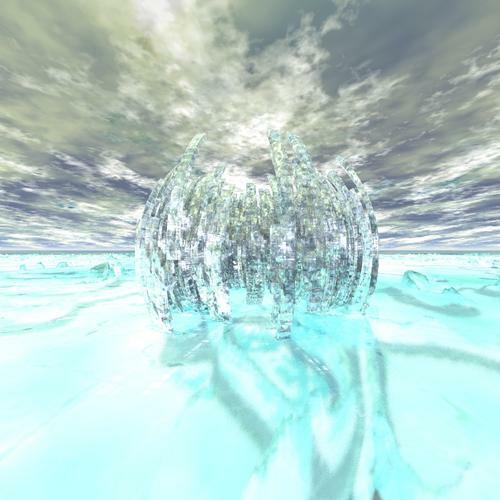 The one with the crystaline structure in space the object is 1.2 million polygons, so I kept the scene simple. 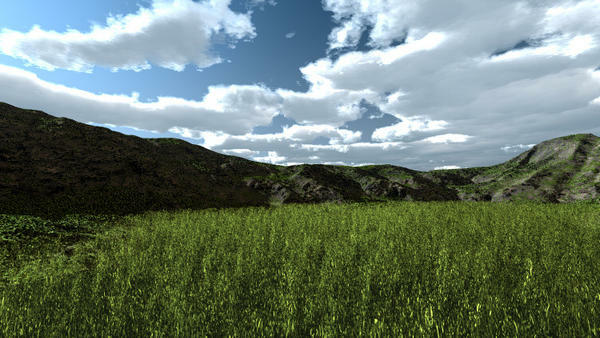 I did a 2nd render of it with terrain objects added to break up the ground a bit, it also turned out well. but for some reason DAZ is now telling me my standard resolution I use for my Bryce Renders is too big to post here, (didn't use to be that way). Oh no, that tron bike is not my render, is just a web image, a blender render, which i posted it here as reference to remind or to show how it looks the light trail from the Tron Bikes and to get an answer if its possible to get this in Bryce.However you can see bellow a scene with rays using the lit rays material. I thought that the ring is a solid object with some kind of material applied but i saw the tutorial and now i see there is just a light sphere effect.I will try what you said here and in tutorial on a future project to see if i can get a nice result. 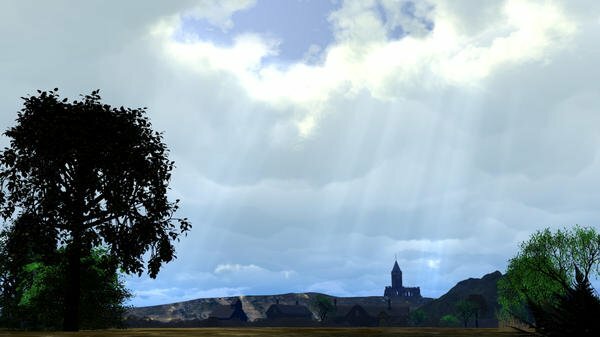 I thought its simple similar to "lit rays" material from MATERIALS>Misc>Lights>Lit Rays which i used it on the scene bellow to create the sun rays through a (yours i think) slab from a free content scene in Bryce and the terrain from the eolian generators scene. Those streaming light rays look good, cris333. Credit where credit is due, a fellow called Frozencry on Bryce5.com came up with this idea, indeed, his original images and source material is available there. Today then? Grass companion files. Mighty fine grass David - yet another tutorial I need to find the tome for LOL. 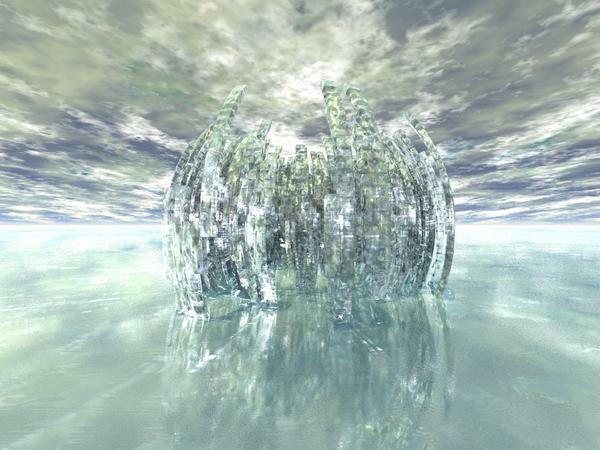 @Rareth - I like the second render of your Ice Palace, but somehow I like the first one better. Not sure why as the other objects on the ground do add some more interest, but there's something about the pristine ground in the first version that just fits perfectly with the "Ice Palace" title. Thank you Miss B and Dan, well the thing is... it's not really real... here I've used more of an painters trick than a 3D artists. Back in the dim dark distant past when pixels were not just a twinkle but giant pavings stones and rendering was only for super computers, and artists used paint. It wasn't really practical to paint every blade of grass (but clearly these days we could - given the right tools and some time, render every blade of grass). However, Bryce doesn't quite have the right tools, so what I've tried to create here is the impression of grass. Grassishness - if you will. 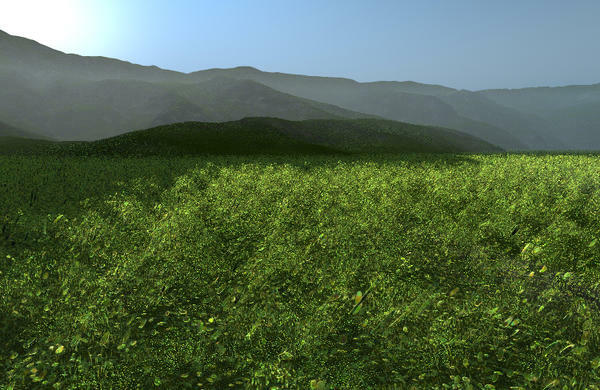 By simulating what the eye sees when it takes in grass as a whole. If you look closely at any part of the grass here, it's a mixture of semi transparent ovals of different colours and scales. The impression though, is easy on the eye I find. Possibly better, depending on the subject, than exact simulation - for "artistic" reasons. And that's my excuse and I'm sticking to it! Can only concur. The pics are small, so it must have taken long to render them. I noticed at first glance that it is an illusion, but very convincing and well made. Has someone already tried Gnofract 4D? Popular and widely used. Over 30,000 downloads to date. looks like a nice fractal generator, but it doesn't look like it exports to .obj or as 3d models. My misunderstanding, i thought you did this in blender, don't know much about this program except that it is mentioned a lot on the forum. I like the your rays render. 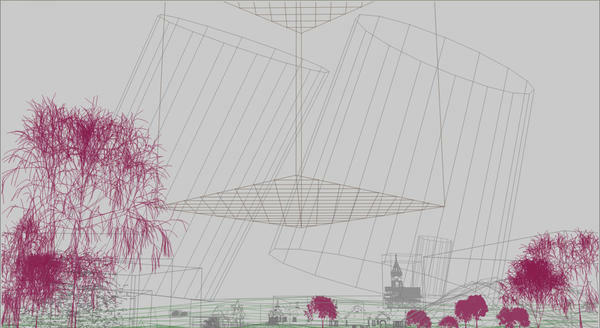 Thanks for posting the wireframe view as well. It helps beginners like me to see both views. @ Rareth - I like the new Fractal render. @Rareth: Love what you're doing this time around. But I like those types of images anyway. Nice job. @cris: That is a lovely image. And love the look of the light rays. Great job. @David: I had to go back and really look before seeing construction was different than using terrains. I like the results. Bear looks real. How are you handling the fur? Amazing sort of grass. It plays with the viewers unconscious mind, the viewer fills in the missing information based on the clue provided, understanding the noise to be grass. This is brilliant, and a step toward surface replicators which should in theory be able to cover any surface of any size with grass and ground level plants. I know the render time is slow, so only the most basic lighting can be used and animation is out of the question. Raytracing, while accurate, takes too long to render with blend transparency. Most of the time spent in my Bryce renders is due to shadows and their calculations. 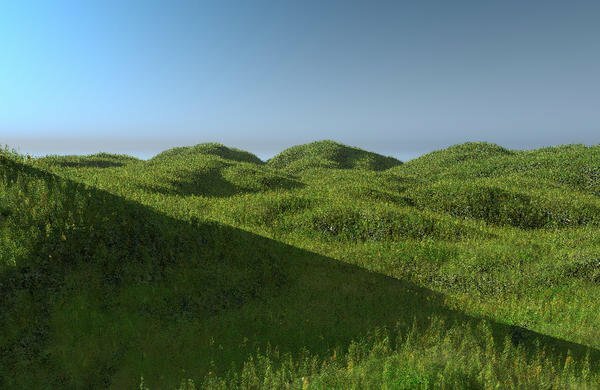 In Bryce 8 I hope we are given the option to produce raster soft shadows, should speed rendering considerably especially for things like blend transparency grass blades. It's kind of trickery. It's just a normal bump map .tiff, the trickery part is rendering it so there's just enough noise included to keep it rough looking... I think David does the same thing with his grass. 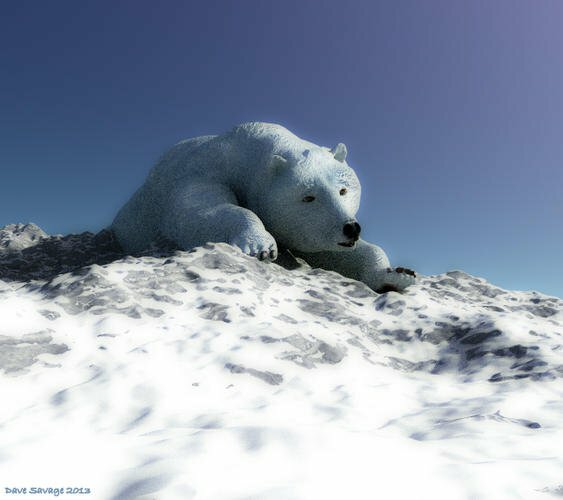 @TheSavage64 - the polar bear looks indeed very real - and cute, too. Well, it sort of is and it isn't Jamie. If you think of it this way, the pattern of the grass in the material if it were rendered volumetrically would be like lots of closely packed straws weaving this way and that. But... this would be very slow to render indeed, also it wouldn't look very much like grass. So what the terrain does is present random 2D slices through this volume. Because although the material is only a surface type, it still exists in 3D space, it's just that the surfaces don't occupy all that 3D space. What seems to happen when a material is rendered as a volume is that it whatever solid it is applied to is subdivided into slices (the number dependant on the quality setting in the material lab) - so by using a terrain this is a sort of compromise between a flat surface and a 3D material. The problem as Rashad correctly identified (thank you Rashad for your kind remarks) is that as Dan has previously observed there is some issue with the way transparency is handled in Bryce which causes long render times particularly on the AA pass (even with a high threshold) - hence as Eireann indicated, small resolution images = long renders. But also, this is one of the few occasions where the material has to be scaled to the output resolution of the image rather than to match the scale of the objects in the scene. Since this grass is more illusion than actual geometry, the perception of the pattern is critical. 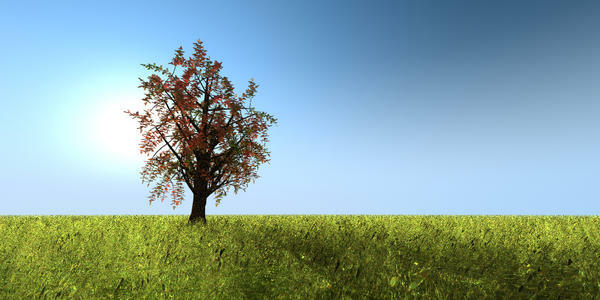 Indeed, often the grass looks better when it is only partially rendered than when it is finished. So strongly is the illusion dependant on pixel scale. I find this interesting, but obviously it is not an ideal solution. Dave might try, if he has the inclination for such an experiment, in DS there is a control that allows the creation of a shell taken from your model that can be offset by a bit... unfortunately this tends to turn smaller things inside out - like ears and such. However, if used craftily, it could be used on your bear to create a fur effect layer. Now I had got this process written down in a forum thread somewhere, but... this forums search capabilities are somewhat limited and I can't find the thread any more. So that just makes life a little bit more difficult. As I recall the key words were "shell" and "offset" so if anyone can figure out how to get the search here to boolean two words in the advanced search then the thread might be found. 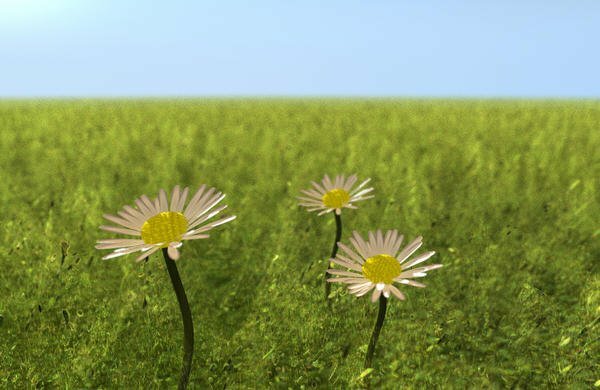 Indeed, often the grass looks better when it is only partially rendered than when it is finished. Would it be an option to exclude the grassy object from the AA-pass? Faster render, better looking? Just a thought. @Rareth - Thanks again for the tip about the option to export objects from Structure Synth. 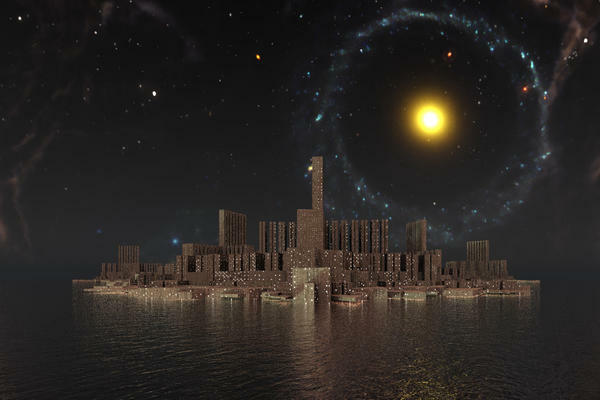 The city is a Structure Synth object (example Navla Systems with Seed set to 6), the backdrop is from David and my Deep Space 1 HDRI. Still a WIP.